Hi Townharry - got it at last, hope it's the one you are looking for. Seaview Terrace, Whitewell or as we knew it, Peters Hill. Very many thanks JohnC, i have been trying to get a photograph of these cottages for years and i am thrilled you have came up trumps. The other photo's you have posted are excellent too, keep up the good work !! Hello Everyone, I've just found this site 31/7/08 and what a find, thank you. I lived in the Whitewell 1937/39 and 45 to 1950 in Upper terrace. The photo is Peter's Hill and my Uncle Bob and his wife lived at number 9, the white door second from end. this was up on the right of the back entrance to Bellevue. The road came in between Doctor Loughridges house and the waterworks pumping station and up past Peter's Hill to the back of the zoo to Bellevue. 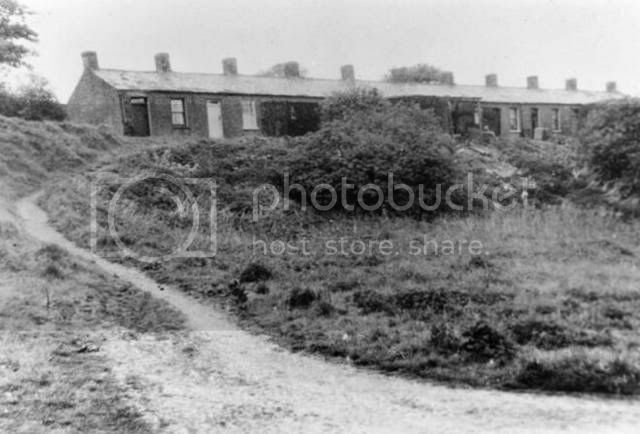 Has anyone got any more photos of the rows of houses? Looking at some of these letters has taken me back to my second childhood. Glad to hear you liked the photo of Peters Hill. I know well all the places you mention but cannot remember the name Watford. I lived at Lower Terrace (Front Row) Whitewell from 1935 to 1953. I hope you have seen my other photos at "Whitewell and Glengormley" especially the one of the Front Row and I'm sure you remember the man standing at the Well. Hi I just found this website and think it is great! My Grandmother used to live in Seaview Terrace, Peters Hill. Her name was Eileen McKernon and she married Patrick McKernon. She had 3 sons and 1 daughter, Patrick, Kay, Brian and Thomas. My Father is Patrick McKernon who lived in the bungalow at the zoo and worked there for many years. It was great to see photos of old Whitewell as I heard a lot about it from my Dad and Grandmother. I used to live in Dr Loughridges old house when I was small just before it was knocked down. Does anybody have any photos of Dr Loughridges House. Sorry I misread your name - I now see it is Peter Hamill and you live in Watford. I still cannot recall the name Hamill. There was a Robert McCarthy who lived at 9 Peters Hill and a Mrs J. McCarthy who lived at 10 Upper Terrace. Is this the connection? Sorry, not a good photo but the only one I have of Dr. Loughridge's House, Whitewell. Thanks Rob for the memories. Hi John C, thanks for the photo of Dr Loughridges house. I have been looking for a photo for ages. It is good to see a photo of the area long ago before any houses or roads built but the house looks just the same when I lived there. I knew Pat Duffy when he worked in the Zoo with my dad Patrick McKernon. As far as I know he is still living down the whitewell Road. His wife died not long ago. I have heard of the name Toosie Gilmore but not John Conway. My dad is coming down on Wednesday and I will ask him and reply back then. He will probably have more information than I would. Does anybody have any old photos of what it was like inside the Floral Hall. Sorry to have caused confusion with my identity. My christain names are Peter Hamill and surname Mc Carthy. My uncle is the Robert Mc Carthy living at 9 Peters Hill and my grandmother Mrs. J. Mc Carthy living at 10 Upper Terrace. She died January 1939 and Robert died 1952. I was always known as Hamill Mc Carthy. I leftand joined the R.A.F. in September 1950. The John Conway I knew was always called Pete and lived on the front row, Toosie Gilmore lived at, I think 4 or 5 and Pat Duffy lived at about 17 Upper Terrace. Pete Conway had left the Whitewell by 1955 and I think went to live in England. Got your name right now. I think John Conway died a number of years ago. Any photos of Whitewell ?